Specialty CME Credits: Included as part of the 4 credits, this CME activity is eligible for 4 Trauma CME and 1 Pharmacology CME credits, subject to your state and institutional approval. More than 1.7 million traumatic brain injuries occur in adults and children each year in the United States, with approximately 30% occurring in children aged < 14 years. 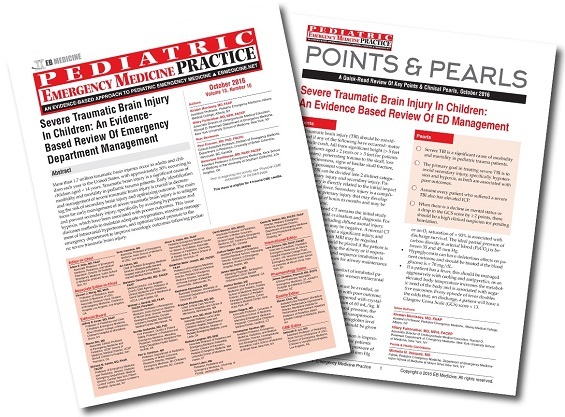 Traumatic brain injury is a significant cause of morbidity and mortality in pediatric trauma patients. Early identification and management of severe traumatic brain injury is crucial in decreasing the risk of secondary brain injury and optimizing outcome. The main focus for early management of severe traumatic brain injury is to mitigate and prevent secondary injury, specifically by avoiding hypotension and hypoxia, which have been associated with poorer outcomes. 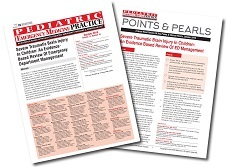 This issue discusses methods to maintain adequate oxygenation, maximize management of intracranial hypertension, and optimize blood pressure in the emergency department to improve neurologic outcomes following pediatric severe traumatic brain injury. A 22-year-old mother of 3 brings her 3-month-old boy to the ED, stating that he has not been feeding well. She is vague in her description of the child’s symptoms. The nurse calls you into triage because she notes the child appears unresponsive. The mother denies any trauma. The infant’s vital signs are as follows: afebrile; heart rate, 160 beats/min; blood pressure, 70/40 mm Hg; respiratory rate, 30 breaths/min; and oxygen saturation, 93% on room air. You struggle to calculate a GCS score, as this patient is not yet verbal. On physical examination, the child is minimally responsive and has irregular and shallow respiration, so you prepare to intubate. During placement of an IV line, the child flexes his left arm in response to pain, but no spontaneous movement of the right arm or leg is noted. During the secondary survey, you note a bulging fontanelle and a dilated left pupil, with deviation of the left eye both downward and peripherally. You have the clerk page neurosurgery emergently. The respiratory therapist asks you if you would like to hyperventilate the patient. What should your target PaCO2 level be? What medication(s) should be given immediately? Once stabilized, are there any other services or specialists that should be involved with this patient, based on the history?